Drew McQueen Bledsoe (born February 14, 1972) is a former American football quarterback who played 14 seasons in the National Football League (NFL), primarily with the New England Patriots. He served as New England's starting quarterback from 1993 to 2001 and was considered the face of the Patriots franchise during his eight seasons with the team. The first overall pick in 1993 NFL Draft, Bledsoe helped improve the fortunes of the Patriots, who had fallen on hard times. Under his tenure as starting quarterback, the Patriots ended a seven-season postseason drought, qualified for the playoffs four times, and made one Super Bowl appearance in XXXI. He was also named to three Pro Bowls and became the youngest quarterback to play in the NFL's all-star game at the time with his 1995 appearance. Following a period of declining success and two consecutive seasons where the Patriots missed the playoffs, Bledsoe suffered a near-fatal injury early in the 2001 season and was replaced as starter by backup Tom Brady. Bledsoe was unable to regain his starting position after he was medically cleared to play due to Brady's success with the team, which culminated with the franchise's first Super Bowl title in XXXVI. Bledsoe subsequently retired after short stints with the Buffalo Bills, where he made a fourth Pro Bowl appearance, and the Dallas Cowboys. While his tenure with the Patriots would ultimately be eclipsed by Brady, Bledsoe is recognized for helping rebuild the franchise, including leading the team to victory in the 2001 AFC Championship after Brady was injured en route to their first Super Bowl win. For his accomplishments in New England, he was inducted into the Patriots Hall of Fame in 2011. Bledsoe attended Walla Walla High School and was a letterman in football, basketball and track. In football, he was named a first team All-State selection by the Tacoma News Tribune. In track, he competed in the throwing events, recording top-throws of 45.34 meters in the discus throw and 54.70 meters in the javelin throw. Bledsoe had a record-setting career in his three years at Washington State. After gaining the starting job in the end of the 1990 season as a true freshman (joined later by Jeff Tuel as the only two in school history), he quickly became the face of the Cougars offense. In 1992 Bledsoe led his team to a 9–3 record (ranking #10 in the coaches poll and #12 in the AP) and a 31–28 win against the Utah Utes in the Copper Bowl. Bledsoe completed 30-46 passes for 476 yards and 2 touchdowns in the game. He also established WSU records in single-game passing yards (476), single-season pass completions (241), and single-season passing yards (3,946). He was named the Pac-10 Offensive Player of the Year. Following an impressive junior year Bledsoe decided to forgo his senior season and enter the 1993 NFL Draft. In the 34 starts of his collegiate career he amassed 9,373 yards, 532 completions and 66 touchdowns. Bledsoe was drafted first overall in the 1993 NFL Draft by the New England Patriots. He started right away for the Patriots in his rookie season, as they improved from two to five wins. On November 13, 1994, the Patriots had won just three of their first nine games and were losing, 20–3, to the Minnesota Vikings at halftime. Bledsoe led a comeback victory in which the Patriots won, 26–20, in overtime, as he set single game records in pass completions (45) and attempts (70). The win sparked the beginning of a new age for the Patriots, as they rallied behind Bledsoe and won their final six games to finish with a 10-6 record and captured the wild card; however, they lost to the Cleveland Browns in the wild-card game 13-20. Due to his performance, Bledsoe was selected to his first Pro Bowl as an alternate. Following a difficult 1995 season, Bledsoe turned it around in 1996 ranking among the top passers in the league with the help of wide receiver Terry Glenn, thus pushing the Patriots to reach the playoffs again and winning the AFC championship against the Jacksonville Jaguars, 20–6. This led to an appearance in Super Bowl XXXI, where they lost to the Green Bay Packers by the score of 35–21. Bledsoe completed 25 of 48 passes for 253 yards, with two touchdowns and four interceptions in the loss. He was also named a starter for the Pro Bowl that season, the second of his career. Bledsoe in 2001, during his tenure with the Patriots. During the 1997 season, Bledsoe helped the Patriots win five of their final seven games to once again qualify for the playoffs, the fourth time in eight years as a Patriots starter he would lead the team to a postseason appearance. The Patriots lost in the second round to the Pittsburgh Steelers, however Bledsoe built a career-high 87.7 passer rating, passed for 3,706 yards, tossed 28 touchdowns, and earned his third Pro Bowl invitation. The following year, he became the first NFL quarterback to complete game-winning touchdown passes in the final 30 seconds of two consecutive games. In doing so, he propelled New England into the postseason for the third straight year. He completed these come-from-behind efforts while playing with a broken index finger on his throwing hand, an injury that would later sideline him for the postseason. Bledsoe started the 1999 season very strong, with 13 touchdowns and only four interceptions as the Patriots held a 6–2 mid-season record. However, Bledsoe subsequently threw only six touchdowns versus 17 interceptions, and the team finished with an 8–8 record. The team's slide continued into the 2000 season as the Patriots ended with a record of 5–11. While Bledsoe threw a then-career low 13 interceptions that year, he was sacked 45 times. In March 2001, Bledsoe was signed to a then-record ten-year, $103 million contract. Bledsoe did not finish his career with the Patriots, nor see the opening of the new Gillette Stadium. During the second game of the 2001 season, Bledsoe was hit by New York Jets linebacker Mo Lewis and suffered a sheared blood vessel in his chest, which almost resulted in his death. Replacing Bledsoe, backup Tom Brady took the starting position and led New England to the playoffs. Though he never regained his starting role, Bledsoe proved integral to his team's playoff run when he replaced a hobbled Brady in the AFC Championship Game against Pittsburgh. Bledsoe, starting from the Steelers 40-yard line, capped a scoring drive with an 11-yard touchdown pass to David Patten to seal a 24–17 victory. In winning the conference championship game, Bledsoe completed 10 of 21 passes for 102 yards and a touchdown, with no interceptions. It was the second time in six years (1996 and 2001) that Bledsoe was an integral part in leading the Patriots to a Super Bowl appearance, and during the on-field trophy presentation Bledsoe tossed his father a game ball. Tom Brady started as quarterback as the Patriots won Super Bowl XXXVI, with kicker Adam Vinatieri hitting a game-winning 48-yard field goal as time expired. Appreciative of his lengthy tenure with the team, Patriots fans cheered Bledsoe in each of his three returns to New England as a visiting player. A change of scenery—by way of a trade—to Bledsoe's former division rival Buffalo seemed to give him a bit of rejuvenation in 2002. He had one of his best seasons ever, passing for 4,359 yards and 24 touchdowns and making his fourth trip to the Pro Bowl. In Week 2 against the Minnesota Vikings, Bledsoe set a team record with 463 yards passing in an overtime win. He continued his strong play in 2003 as the Bills began the year 2–0. However, a flurry of injuries stymied the Bills offense; they failed to score a touchdown in three consecutive games en route to a 6–10 season. In 2004, they fell one game short of making the playoffs; a late season winning streak was wasted when Bledsoe and the Bills performed poorly against the Pittsburgh Steelers backups in the season finale. Bledsoe was released by the Bills after the 2004 season to make way for backup quarterback J. P. Losman. When Bledsoe was later signed by the Dallas Cowboys, he expressed bitterness with the Bills for the move, stating "I can't wait to go home and dress my kids in little stars and get rid of the other team's [Buffalo's] stuff." 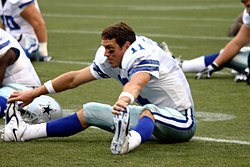 Bledsoe stretching before a game with the Cowboys in 2005. Bledsoe with Greg Ellis in a 2006 game. Bledsoe went on to sign with the Dallas Cowboys, where he was reunited with former coach Bill Parcells. Bledsoe was intended to be a long-term solution as quarterback for the Cowboys. Said Bledsoe on the day he signed with Dallas, "Bill [Parcells] wants me here, and being the starter. I anticipate that being the case and not for one year." He signed for $23 million for three years. During his tenure with the Cowboys, he threw for over 3,000 yards in a season for the ninth time in his career, tying Warren Moon for fourth in NFL history. That season, Bledsoe led five 4th quarter/OT game-winning drives to keep the Cowboys' playoff hopes alive until the final day of the season. Though the team ultimately failed to reach the playoffs, Bledsoe had led them to a 9-7 record, an improvement over the 6-10 mark that Vinny Testaverde had finished with in 2004. However, in 2006, his final season with the Cowboys, Bledsoe's play became erratic, so much so that six games into the season he was replaced by future Pro Bowler Tony Romo. Shortly after the end of the 2006 season, Bledsoe was released by the Cowboys. Unwilling to be relegated to a backup position, Bledsoe announced his retirement from the NFL on April 11, 2007. When Bledsoe retired in April 2007, he left fifth in NFL history in pass attempts (6,717) and completions (3,839), seventh in passing yards (44,611), and 13th in touchdown passes (251). On May 16, 2011, Bledsoe was voted by Patriots fans into the Patriots Hall of Fame. He was formally inducted in a public ceremony outside The Hall at Patriot Place on September 17, 2011. Bledsoe beat former head coach Bill Parcells and defensive lineman Houston Antwine in a fan vote. In July 2012, Bledsoe was named the 30th greatest quarterback of the NFL's post-merger era by Football Nation. In January 2018, Bledsoe was named honorary captain of the New England Patriots as they hosted the Jacksonville Jaguars in the AFC Championship Game. Bledsoe's Patriots had beaten the Jaguars 20–6 in the 1997 AFC Championship Game to advance to their second Super Bowl. Patriots owner Robert Kraft said in a statement "Drew Bledsoe played such an integral role in our efforts to rebuild the Patriots. He gave fans hope for the future by providing many memorable moments during his record-breaking career. For a franchise that had only hosted one playoff game in its first 35 years, winning the AFC Championship Game at home in Foxboro and taking the Patriots to the playoffs for three consecutive years were unimaginable goals prior to his arrival." The Patriots defeated the Jaguars 24–20 to advance to their tenth Super Bowl appearance and Bledsoe presented the Lamar Hunt Trophy to Kraft. Bledsoe's parents were school teachers in Ellensburg, Washington. His mother was a teacher at Lewis & Clark middle school, located in Yakima Washington. His father was a coach who ran a football camp in Washington state, and Drew was able to interact with the professional players and coaches who helped his father run the camp. The Bledsoe family moved five times before Drew was in the sixth grade. They finally settled in Walla Walla, Washington, where Bledsoe's father coached football at the high school. The only time Drew played a whole season of football without ever starting at quarterback was in seventh grade at Pioneer Junior High. In high school, with his father as his coach, he won numerous awards, including selection to the Western 100 and Washington State Player of the Year. He was heavily recruited by colleges such as the University of Miami and the University of Washington, but he decided to attend Washington State, which was a mere two-hour drive from home. Drew and his wife Maura live in Bend, Oregon and have four children: sons Stuart, John, Henry, and daughter Healy. He coached his sons, Stuart and John, at Summit High School. His son John was a walk-on player on the Washington State football team in 2017. While playing for the New England Patriots, Drew Bledsoe lived in Bridgewater, Massachusetts on Tabway Lane, and in Medfield, Massachusetts, in a house that was later purchased by retired Major League Baseball player Curt Schilling. After his retirement in 2007, Bledsoe founded the Doubleback Winery along with close friend Chris Figgins. The company's grapes, mostly Cabernet Sauvignon and Chardonnay, are harvested from McQueen Vineyards and Flying B Vineyards, located in and around Walla Walla, Washington. The wine has had success recently,[when?] placing 53rd overall in Wine Spectator's Top 100 wines. His first vintage which was 2007 vintage quickly sold out of its initial 600 cases. In 2012, Marvin R. Shanken invited Ernie Els, Greg Norman, Tom Seaver and Bledsoe to introduce his wines, despite Shanken's disdain for the New England Patriots. He also recorded a message to both Tony Romo and Dak Prescott in 2017 in his home, which also showed his red wine collection. In his spare time, Bledsoe works with many philanthropic organizations. Bledsoe is the offensive coordinator/quarterbacks coach at Summit High School in Bend, Oregon, having held the position since 2012. He passed for 3,291 yards in 2000, his seventh consecutive season with at least 3,000 yards passing. Bledsoe was durable during his career, playing in 126 of his first 132 games since entering the league in 1993, and never missing a start after leaving NE until benched in 2006. In 2002, his first season in Buffalo, he set single season records for yards, attempts, completions on an offense that had 7 other franchise records. In 1998, he directed the Patriots to the playoffs for the fourth time in six seasons. In 1994, he set Patriots franchise single-season passing records for attempts (691), completions (400) and yards passing (4,555; surpassed by Tom Brady in 2007). In 1995, he set a franchise record by attempting 179 consecutive passes without an interception (10/23/95 to 11/26/95; since surpassed by Tom Brady). At the age of 23, he became the youngest player in NFL history to surpass the 10,000-yard passing plateau when he connected with Ben Coates on a 6-yard completion just before the half vs. the Jets (12/10/95). Prior to 1994, the Patriots' single-season record for passing yards was 3,465 yards. Bledsoe eclipsed that mark six consecutive seasons. At the age of 22, he became the youngest quarterback in NFL history to play in the Pro Bowl. Led 31 career 4th quarter/OT game-winning drives and holds the record for most TD passes in overtime with 4. Bledsoe was the last quarterback to have led the Buffalo Bills to a winning season until Kyle Orton did so in 2014. While Bledsoe has thrown for a high number of yards and attempts, a frequent criticism is that they are based on volume (attempts, completions, yards) rather than efficiency (passer rating, TD-to-INT ratio, yards per attempt) proving only that he has thrown a great number of times, not that he has thrown well. According to sports writer Don Banks, Bledsoe's large career totals "reveal more about his longevity than about his excellence". Bledsoe ranks fifth all-time in completions (3,839), seventh in passing yards (44,611), and 13th in touchdown passes (251). Bledsoe's career (57.2) completion percentage is lower than all recent[when?] Hall of Fame quarterbacks with the exception of John Elway. Bledsoe's NFL career passer rating of (77.1) surpasses nine Hall of Fame Quarterbacks. Bledsoe's 37 regular season 300-yard passing games ranks 9th in league history. He also ranks 6th (with 6) in most career regular season 400-yard passing games by an NFL quarterback. He was selected to the Pro Bowl four times (in 1994, 1996, 1997, 2002). Bledsoe was eligible for the Pro Football Hall of Fame in 2011. ^ "Drew Bledsoe Biography". Biography.com. A&E Networks. Retrieved November 5, 2010. ^ a b c "Bledsoe is 2011 Fans' Choice". The Hall at Patriot Place. Archived from the original on July 17, 2011. Retrieved July 27, 2011. ^ "Washington State Scout". Washington State Scout. July 9, 2002. Archived from the original on July 16, 2011. Retrieved November 30, 2010. ^ Patriots Official Website. Archived September 27, 2007, at the Wayback Machine . Retrieved August 26, 2007. ^ Patriots Official Website Archived September 27, 2007, at the Wayback Machine. Retrieved August 20, 2007. ^ . September 27, 2007 https://web.archive.org/web/20070927012113/http://www.patriots.com/alumni/index.cfm?ac=alumnibiosdetail&bio=119. Missing or empty |title= (help). Retrieved August 20, 2007. ^ Bledsoe Heads to Buffalo for 2003 Pick ESPN.com. Retrieved August 20, 2007. ^ "Boston Sports Media Watch » Bledsoe Traded As stated here". Bostonsportsmedia.com. April 21, 2002. Retrieved November 30, 2010. ^ Maiorana, Sal (February 17, 2005). "Bills saying goodbye to Bledsoe". USA Today. Retrieved November 30, 2010. ^ JT-SW.com. Retrieved August 20, 2007. ^ "Bledsoe retires, ends 14-year career". ESPN. April 12, 2007. Retrieved November 30, 2010. ^ "Top 100 Modern Quarterbacks: 40-21". Football Nation. July 26, 2012. Archived from the original on October 30, 2012. ^ a b Collins, Louise Mooney; Speace, Geri J. (1995). Newsmakers, The People Behind Today's Headlines. New York: Gale Research Inc. pp. 32–35. ISBN 0-8103-5745-3. ^ a b No sour grapes from retired Bledsoe Dallas Morning News. October 14, 2007. Retrieved October 12, 2008. ^ "Drew Bledsoe watches as WSU Cougars have an intense first padded practice of fall camp". The Seattle Times. August 4, 2017. Retrieved January 17, 2018. ^ "The Story - Doubleback". Doubleback. Retrieved November 8, 2017. ^ "Doubleback -". Doubleback. Retrieved November 8, 2017. ^ Peter King (November 29, 2010). "Josh McDaniels tape; Cortland Finnegan-Andre Johnson fight; more Week 12". Sports Illustrated. Retrieved November 30, 2010. ^ Mitch Stevens (September 30, 2016). "Drew Bledsoe coaching his sons on Oregon high school football team". Max Preps. Retrieved January 15, 2017. ^ CHFF classic: The last word on Bledsoe ColdHardFootballFacts.com. Retrieved June 30, 2007. ^ "No Hall call for Bledsoe". SportsIllustrated.com. April 13, 2007. Archived from the original on April 16, 2007. Retrieved June 30, 2007. Wikimedia Commons has media related to Drew Bledsoe.